Duro Steel 10' Wide by 20' Deep by 8'. 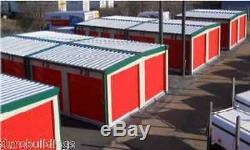 5 Tall Portable or Relocatable Storage Building. Duro Portable Storage Solutions allows more flexibility than traditionally constructed building structures. Portable storage units are an attractive and cost-effective alternative to new construction, particularly if you are in need of just a few more storage units. And because they are movable, they can be placed in areas where you would not typically build permanent structures. These multipurpose structures can be placed in a variety of applications, including home use or outbuilding storage for businesses. 10' Wide by 20' Deep Single Slope 8' Low Side and 8'5 High Side. Includes 1 each 10' Wide by 20' Deep Compartment. Includes 1 each 8'4 Wide by 7. 40 Pound Snow Load, 20 Pound Live Load 130 MPH Wind Load. Duro Portable and Relocatable Steel Buildings - A Building for Every Application. Need extra storage for a vehicle? How about more storage for yard and garden equipment? 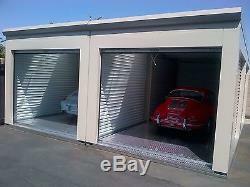 Extra Commercial, Industrial or Retail Storage? Even Permanent extra Home Storage. Duro Portable Steel Buildings by Duro Steel International offer truly portable and relocatable steel building solutions to meet most any commercial or residential need. Our portable steel buildings are easy to assemble and once assembled can be moved with a standard forklift, making them truly portable. Duro Portable Storage Building Benefits. Duro Portable Storage Solution Benefits. Duro offers the same look and benefits of traditional storage. Able to quickly generate additional income. Great for extra home storage. Easily movable by a 5,000 lb. 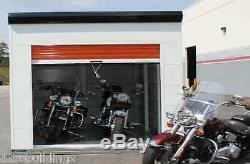 Utilizes easy-to-operate roll up doors which require virtually no maintenance. Secure and convenient for storage renters. Built with special features to reduce moisture. Easy to expand to accommodate growth. Adaptable to odd-sized lots or slightly sloping land/driveways. Standard building permits may not be required (check local ordinances). Economicalincreased rental income with minimal investment. Classified as equipment, portable relocatable and units can be depreciated over seven years. Are often allowed where containers are restricted due to design and aesthetics. Duro Portable Storage Building Specifications & Configurations. Duro Portable Storage Building Features. Duro Portable Steel Building Features Include. Configurable mix on an 8x20, 10x20 or custom size platform. 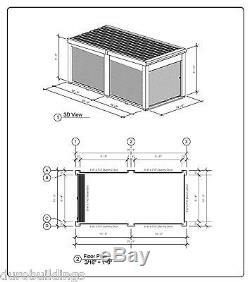 Continuous 22ga galvanized N deck base with plywood flooring (option for diamond plate). Can be anchored to asphalt or other ground materials for stability. Can be wired for electricity. Uses standard 26 gauge doors in over 25 standard color options. Snow load optional up to 50 lb. Special features, including a rain lip and elevated floor, which reduces moisture. Skid panel outside the doors to offer a non-slip entry into unit. Units are built close to the ground for easier access. Duro Steel Buildings - Trusted by Industry Leaders! About Duro Steel - Important Additional Information. The name Duro Steel is recognized around the world to be a leader in pre-fabricated and Industrial Steel Buildings, Steel Building Doors, parts & accessories. Duro Steel Buildings is committed to excellence that's why its backed up by some of the highest standards, such as. Canadian Institute of Steel Construction. Professional Engineers Licensed in 50 States and Canada. Our factory has been manufacturing and distributing Steel Buildings for over 20 years! Duro Steel is proud to provide quality products with customer service second to none! Duro Buildings is a trusted brand name and one of the largest Full Service Steel Building Providers in the world. PRICE MATCH GUARANTEE: If you find this item less expensive anywhere on the Internet, let us know and we will match or beat that price when Comparing Apples to Apples! SUPERIOR CUSTOMER SERVICE: We take pride in providing prompt and courteous customer service. Our goal is to make your customer and shopping experience as easy and convenient as possible. Our Customer Service is second to none! The item "DURO Storage Kit 10x20x8.5 Metal Prefab Portable Steel Building Structure DiRECT" is in sale since Wednesday, January 23, 2019. This item is in the category "Business & Industrial\Building Materials & Supplies\Modular & Pre-Fabricated Buildings". The seller is "durobuildings" and is located in Houston, Texas. This item can be shipped to United States.